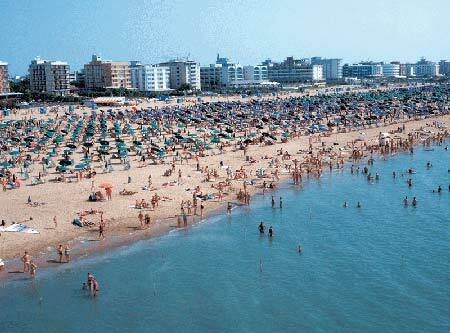 Numerous surprises Bibione reservation to all those who decide to leave the beach and give breath to the body and refreshment accalorato, going inward. First, the pine forest. Varco needed to intrude inland, is in the eyes of tourists as a green oasis and dense wilderness, inhabited by a rich variety of animal species and flora typical of the Mediterranean area, both sufficiently protected. Another left the wide expanse: acres and acres of sand dunes, thick reeds, fishing valleys. Tourists will be so, all of a sudden, catapult in the middle of the lagoon and its fascinating landscape. To break the silence only the rustle of wind among the branches and the flocks of birds that take flight or fall on the water surface to catch some fish. A water flowing slow and in some places seem almost immobile, retained in its flow from the bottom of the clayey-sandy lagoon. A spectacle, especially if you live at the first light of dawn, when you can witness the magical awakening of nature between the sandbanks on Arginello where the colors stand out of the many water birds and, between sky and sea, are a after another typical casoni with thatched roofs, where at one time and, in some cases even today, the fishermen lived, solitary guardians of life dela swamp. A stretch of the lagoon is particularly striking and deserves at least a visit: the Valle Grande, situated in the hinterland, which is formed with the neighboring Vallesina an extremely important naturalist for the presence of a particular species plants. A land of great interest to those involved, or simply are fans of botany. And then, even to enchant the tourists, the mouth of the Tagliamento, ideal place to take beautiful photos, enjoy a rich fishing and bicycling along safe and beautiful cycling routes. For those who prefer, instead, move along the waterway, navigate to the most remote corners of the lagoon or doubling the boundaries between the expanses of dunes and reeds and the sea, there are interesting routes departing from a known point of call: Port of Baseleghe, a place of shelter and assistance for many boats. From here, from this port, are also organized large excursions to Venice and Trieste in the lagoon, the tenets of traditional fishing.